Rick and Morty, which airs on Adult Swim and returns for its second season this summer, lovingly pays tribute to movie tropes we all grew up with, but it also contributes a whole bunch of new insanity of its own. Rick and Morty are basically just Doc and Marty from Back to the Future, but the show is constantly pointing out how weird and potentially destructive that relationship is. The very first time we see Rick, he’s drunk driving his spaceship and is completely out of his mind. The show applies a dose of reality to fun sci-fi concepts to turn them on their head and remind us how insane this all is. The lovable scientist who mentors the young kid is actually a crazy, drunk, rambling guy who is constantly burping and getting Morty in actual, serious danger. The concept of “Rixty Minutes” is pure brilliance. 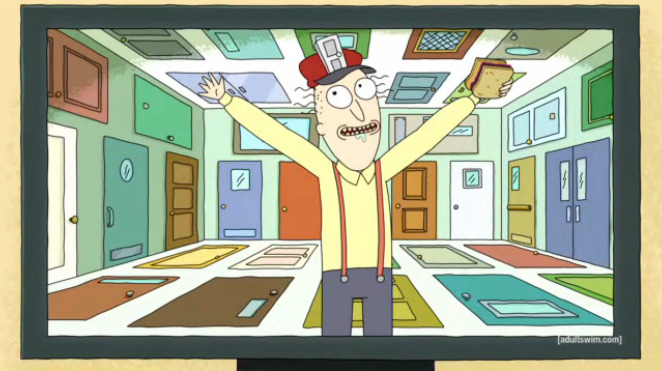 In the episode, Rick sets the family up with a device that allows them to watch television from other dimensions. This allows Dan Harmon and the crew to improvise a series of fake TV shows, which are then animated in these quick, bite sized pieces of joy. Rick and Morty completely embraces the freedom of a cartoon, and this episode makes amazing use of that freedom. It’s pretty clear that most of the TV segments are almost entirely improvised, and the show even includes a few moments of the voice actors cracking themselves up, losing control of the bit and trying to figure out what to say. This gives the episode this fun, loose, experimental feel, both functioning as an episode of television and as 22 minutes of us hanging out with this creative team. All of these segments are completely absurdist and brilliant, like a commercial for “REAL FAKE DOORS” or a TV host named Ants In My Eyes Johnson. Other segments play on TV tropes like the Lucky Charms commercials or trailers for action movies. Since Rick is constantly flipping channels, the episode just keeps getting crazier and more hilarious with an out of control pace. But there’s far more to this episode than just the absurd alternate reality scenarios. In the B plot, Rick gives Jerry, Beth and Summer a headset that allows them to see into alternate reality versions of their own lives. They get to see universes where their lives took different directions, maybe directions better than the ones they really took. In this reality, Jerry is a famous movie star. Beth is a surgeon operating on humans and not pets. Neither of them had their daughter, Summer, and the implication becomes that without her, they were able to achieve their dreams. They reveal to her that Beth wanted to have an abortion, so in these realities, she went through with it. Jerry and Beth have to tackle the idea that they might have abandoned a better life, and Summer is confronted with the idea that she’s a burden to her parents. It’s interesting to think about all the different paths our life can go down at any moment. We make thousands of decisions every day, some very minor and some far more significant, and any of these can completely alter who we are as a person. We decide to walk down a certain street or go to a certain restaurant, and because of that we meet the love of our life. We decide to have children, and so our careers completely shift directions. We don’t go out on a Friday night, and because of that we don’t meet our best friend for life. As silly as the insane realities on the television seem, we can take these all as the culmination of millions of little decisions adding up to create a totally new world. There are probably realities out there that are almost identical to ours except we didn’t have kids. There are others where Garfield is actually Gazorpazorpfield. It can sometimes be overwhelming to consider the impact of all these little decisions, wondering if our life could have turned out differently and maybe even better. Is the universe we’re living in the best one? This is an idea Dan Harmon explored in Community as well with “Remedial Chaos Theory,” an episode which presents six different timelines all diverging from one decision. The roll of a dice completely alters the future of the group and their dynamic. Are we living in the best one? Or are we forever cursed to live in the darkest timeline just because we rolled the die a certain way? In one absolutely brilliant scene of “Rixty Minutes,” Summer talks to Morty about all this and how she’s feeling. She’s having a hard time dealing with the fact that she might not have been wanted by her parents and might not have as much purpose in this world as she thought. How does one justify all this chaos and randomness? Are all of our lives just complete accidents with no grander purpose? Rick and Morty answers that question by saying that yes, life is random and has no purpose. But that’s also okay, because we can derive so much joy out of that chaos and randomness. The world is a strange, dark place. Maybe we don’t have much of a purpose. Maybe the universe is just a collection of random decisions adding up to random, strange things, and our existence is just as random and strange. But that’s okay. We can still find meaningful connections to the people we love. We can join together among shared pop culture experiences and learn to love the chaos and insanity that life throws at us. Life might not have any point at all and it might be completely random, but hey, at least we have TV.